I am proud to announce the reissue of DEAD ROOTS, #7 in the Bad Hair Day Mysteries. A Cozy Mystery with a Haunted Hotel, Ghosts, Secret Passages, and Paranormal Experts on Thanksgiving weekend. Marla’s family reunion at a haunted Florida resort turns up dead bodies instead of fond memories in this spooky cozy mystery. Hairstylist Marla Shore is eager to introduce her fiancé, Detective Dalton Vail, to her extended family over Thanksgiving weekend at Sugar Crest Plantation Resort. But that was before she found Aunt Polly suffocated in bed. Is it a coincidence that her aunt’s father once owned the property? According to rumor, he met with two mysterious Cossacks immediately before his premature death. Their spirits are said to haunt the place, and Marla believes it when she hears a bell tolling outside and feels a cold presence inside the hotel’s rickety elevator. Are ghosts at fault for the strange goings-on, or could politics be playing a part? Sugar Crest is slated for demolition, although some folks would profit if it was remodeled instead. The city council meeting is being held that weekend to determine the resort’s fate. Tensions deepen when another body turns up on the nature trail. Whatever is going on at Sugar Crest, someone is willing to go to great lengths to keep it hidden. But the killer doesn’t count on Marla, who determines to learn the truth even if it means uprooting her family’s unsavory past. Dead Roots was originally published by Kensington. This Author’s Edition has been revised and updated with added bonus materials. Trimmed to Death is the 15th book in the cozy mystery ‘The Bad Hair Day’ series that profiles hairstylist/sleuth Marla Vail. One would think that, with such a long-standing series of adventures behind her, any newcomer to Marla’s world would at least need some degree of prior familiarity with the series, but no such expertise is required in order to delve into the world of South Florida and Marla’s endeavors to succeed. In this latest story, Marla has entered a local charity bake-off contest at a Fall festival, and stumbles upon the dead body of fellow contestant Francine while she awaits the results. This sets off a chain of events in which Marla uncovers a host of food-related possible perps who each would have had a stake in Francine’s demise. As Marla plans her own benefit to support a local historical museum, the threat of repeat deaths looms over her promotion plans for her salon and the community. 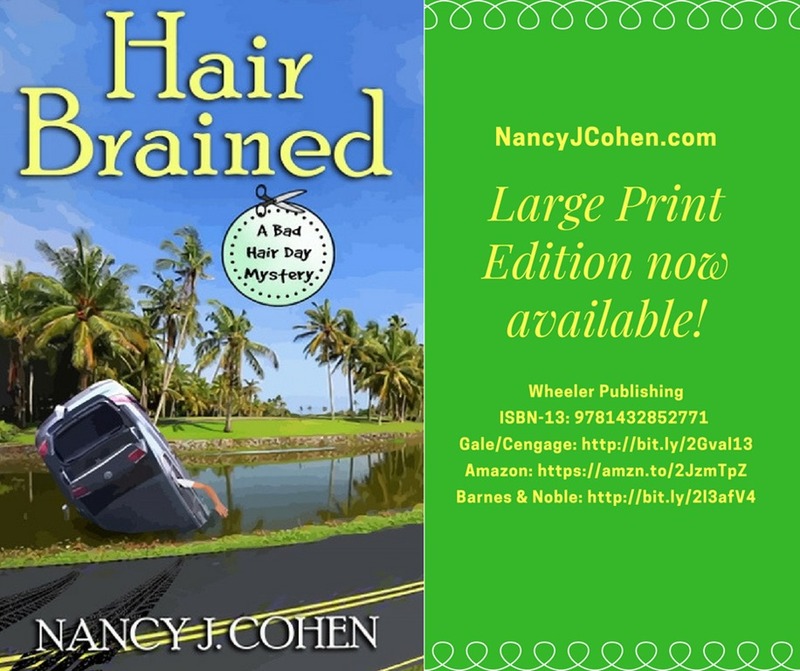 One reason why Nancy J. Cohen is an award-winning cozy mystery author is that her stories are packed with personality, upbeat scenarios, and the solid pairing of a murder mystery with broader community entanglements. In this story, Marla isn’t just a sole proprietor operating independent of her world; she’s thoroughly connected to the community through her salon and work. Marla took a look. Crawfish cocktail, conch fritters, gator bites, deviled crabs. Those didn’t appeal to her, either. “How about the guacamole?” she asked in a less than enthusiastic tone. It wouldn’t be her appetizer of choice. “The dip comes with pita bread. And what’s this pawpaw martini?” Dalton asked. From fundraiser activity, culinary insights, and probes into Marla’s logic to recipes and romance which pepper the story line and embellish its twists and turns, readers who want a cozy mystery filled with atmosphere, intrigue, and adventure should settle a chair by the fire for a good evening’s read. Mix together a cocktail for murder, add a few salty suspects, toss in a dollop of sweet humor, and you have the recipe for Trimmed to Death, #15 in The Bad Hair Day Mysteries. The Large Print Edition of Hair Brained is now available! Large print editions are great if you want to reduce eye strain. Order your own copy or ask your librarian to order the book for you. Reviews are always appreciated. When hairstylist Marla Vail’s best friend is hurt in a suspicious car accident, Marla assumes guardianship of her infant son and becomes embroiled in another murder mystery. Her husband, Detective Dalton Vail, determines the crash may not have been an accident. But who would want to kill Tally—or Ken in the car with her? As Marla digs deeper into her friends’ lives, she realizes she didn’t know them as well as she’d thought. But it’s her duty as their son’s guardian to ensure his safety, even if it means putting her own life at risk. Order a Copy Now or Buy a Copy for a Friend. Marla’s friend, deli owner Arnie Hartman, knows the farm owner’s son. He begs Marla to investigate to help clear the smear on the farm’s reputation. She’s joined by her husband, homicide detective Dalton Vail, in interviewing the bake-off contestants and judges. There’s no shortage of suspects. A celebrity TV chef, food critic, olive oil importer, food truck owner, pastry chef, and cookbook author may be stirring up more than their next recipe. Can Marla unmask the killer before someone else gets trimmed from life? 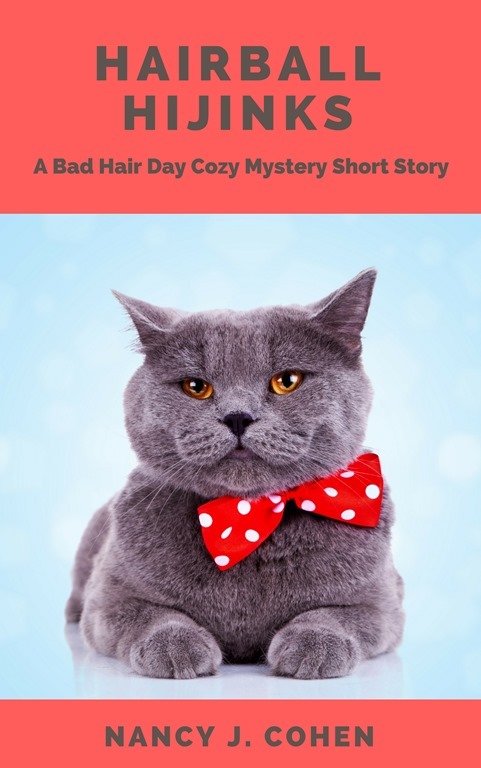 Hairball Hijinks: A Bad Hair Day Cozy Mystery Short Story, is now available for pre-order. With thanks to Lois Crockett for suggesting the book title. Spoiler Alert: This story comes after Hair Brained and contains spoilers, so you might want to read that one first. Hairstylist Marla Vail agrees to help find a neighbor’s lost cat and discovers a ransacked house where more than the pet is missing. Savvy hairstylist and super sleuth Marla Vail visits her friend Tally who just got out of the hospital after a serious car accident. Marla has been caring for Tally’s baby and is sad but grateful to return him to his mother. She and Tally reconcile their friendship that had become estranged before the crash. Happy to have her friend back, Marla is about to leave when a knock summons her to the door. It’s a distraught elderly neighbor who claims her cat is missing. Marla, unable to turn down a person in need, accompanies the lady home. But when Marla enters the house, she realizes much more is missing than a lost feline. The place has been ransacked, and when she calls the police, they inform her the neighborhood has been beset by a series of thefts. Can she find the crooks before they cause another cat’astrophe? Stylist Marla Shore goes undercover in a hair-brained scheme to catch a killer in her latest South Florida adventure. In a story braided with unexpected twists and curls, she takes on a role as nurse’s aide for wealthy Miriam Pearl. While Marla snoops into the elderly matriarch’s affairs, her boyfriend, Detective Dalton Vail, is afraid that the only affair she’ll snag is with her ex-spouse, Stan. Juggling work at her salon, crime solving, and two amorously inclined males, Marla fights a race against time to save Stan before the dashing detective nails him for murder. Marla tried to fathom the dynamics of their conversation. Florence seemed to be attacking Kimberly’s values while Stella was defending them. Why was the elderly aunt coming down so hard on the dead girl? Did it have anything to do with Florence having been in love with Kim’s father? She wheeled Miriam away to a discrete distance, on a slight rise where the driveway curved toward a tree-lined avenue leading to the obscured entrance beyond the woods. It was far enough that she wouldn’t appear to be eavesdropping yet could still hear their faint voices. Marla didn’t respond, too intent on listening. Her hands placed lightly on the wheelchair handlebars, she inclined her head. “By killing her?” Florence said in an incredulous tone. “Hell, no.” Florence shook her elegant head. “If you want to know, Kimberly was messing in things she didn’t understand. She should have minded her own business.” Leaning forward, she spoke in such a low tone that Marla couldn’t catch what she was saying. Damn, she needed to be closer. Frustrated, Marla took a few steps forward. Suddenly, she heard a shriek. Whipping around, she let a cry erupt from her lips at the sight that greeted her. Miriam’s wheelchair coasted down the hill at an increasingly perilous speed. 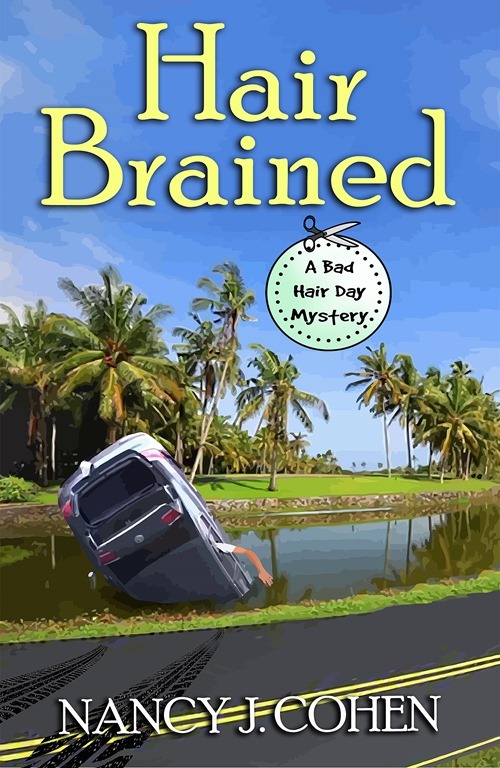 Today is Release Day for Hair Brained (#14 in the Bad Hair Day Mysteries)! Book Launch Party tonight at 7:00 – 8:30 pm EDT. Join us at https://www.facebook.com/NewReleaseParty/ Fun and Prizes! Please consider how important reviews are to authors and leave a customer review on any of the sites above! My Virtual BLOG TOUR starts today. Please honor my tour hosts by visiting each site and leaving a comment. Go Here for my tour schedule including author interviews, guest posts, and giveaways. Enter Here Sept. 11 – 22 to win a Tea Lover’s Basket & a Signed Copy of Facials Can Be Fatal to celebrate the release of Hair Brained. Click Here Sept 1 – 18 to enter for a $25 gift card to Amazon/BN in our monthly drawing.